Zoeller float switches are three types - Tether, Vertical and Variable Level. Zoeller sump pump float switch replacement is part of periodic maintenance required every three to seven years depending upon the frequency at which the pump runs. No manufacturers float switch will last forever. Learn how the Zoeller vertical float switch works, why it fails and what Zoeller has done to improve its life span. Learn how to install a Zoeller switch replacement. We compare Zoeller float switch types to help you discover the best float switch type for your water pumping needs. Since Zoeller is very popular and is the plumbers and contractors preferred brand, we are providing the following information to help you understand more about the Zoeller float switches. Select a specific topic for Zoeller float switches if you wish to read about the topic immediately. Otherwise scroll down the page to see all topics. Zoeller uses three types of switches: the tether, the vertical 2-pole mechanical and the external independant variable level float switch. 1) The tether float is found on Model 49-000. It is part of the sump pump whereas the variable level float switches are external and independent of the sump pump. 2) The vertical two-pole float switch is found on submersible sump pump Models Mighty-Mate M53, M55, M57, M59, M63; Aqua-Mate models M72, M73, M75 and M76; and models Flow-Mate M96, M98. M137 and M139, Models M151, M152, M153, M161, M163, M165, M185, M186, M188 and M198. The vertical float switch is also found on sewage and dewatering pump Models M212, M264, M266, M267, M270, M282, M284, M292, M293, M294, M295; and Grinder Pump Models M803, M805, M807, M818, M819, and M915. 3) The external independent variable level float switch which is a tether switch which is used on the non-automatic pumps to convert them to automatic pumping. The variable level float switch is not attached to the sump pump. It is external and independent. 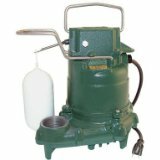 Non automatic sump pump models include Mighty-Mate N55, BN57, N59, and Flow-Mate N137 and N139. Non automatic sewage and dewatering pumps include models N264, N266, N267, M279, N282, E284, N292, E293, E294, M296, E404, E405, E611, E621, E631, E641, E651 and F661. 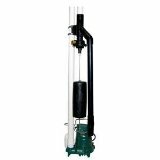 Non automatic ginder pumps include N803, N805, N807, N818, N819, N820, N840, N841, N842, and N915. Back to Zoeller Float Switch Topics. What Is Unique About The Zoeller Tethered Float Switch? The tethered float switch has a tether with a float at the end. As the water rises so does the float. When the float it extended out the switch is triggered to send power to the pump to operate. If the float should ever fill with water, it will sink to the bottom and not operate. Many homeowners like to extend the length of the tether as much as possible so more water leaves the basin every pumping cycle; however the longer the tether the larger the pit diameter must be and the more potential there is for float hang-up. What Are The Characteristics Of The Zoeller Vertical Float Switch? Two types of vertical float switches are used. 2) The vertical two pole electro mechanical-switch has an electronic component which carries a small charge (current) which activates the pump. This reduces float-switch wear and tear and thus extends its life. The warranty is 5 years. It is used on the Might-Mate M63 and Flow-Mate M95. A puncture of the float cannot cause the pump to fail because the float is buyoant and solid. The two pole float cannot get hung up or caught. The float also has a top protective guard for additional float protection. Over time the float-switch will require replacement. For the mechanical switch replacement used with the M53, M55, M57, M59, M63, M72, M73, M75 and M76, M98, M137, M139, M151, M152, M153, M161, M163, M165, M185, M186, M188 and M198 is recommended every three to five years depending upon frequency of pump running. It simply wears out. Replacing the switch is easy. For the electro mechanical switch replacement used with the M63, M95 is recommended every five year to seven years depending upon frequency of pump running. The vertical-float-switch is found in the Zoeller Models M53, M55, M57, M59, M63, M95, M98, M137 and M139. The switch is C shaped. The rod for the float rises as the water causes the float to rise; when the rod hits the top of the C shape it turns the pump on. When the water lowers the float and rod lower and the switch goes off which causes the motor to shut off. Over time the switch wears. As it wears it causes arching. Arching and switch wear causes the switch to fail. Obviously if the switch fails, the pump-motor will not work. What Zoeller Has Done To Improve The Switch? Zoeller has upgraded its vertical switch to an electro mechanical-switch which has an electronic component which carries a small charge (current) which activates the pump. This reduces wear and tear and thus extends the life of the switch. Unfortunately this upgraded switch is only found on the M63 and the M95 which have a 5 year warranty. What Is Different About The Zoeller Variable Level Float Switch? The variable level float switch manufactured by Zoeller is used for non-automatic pumps (the pumps that have no float-switch to start and stop them; they keep running unless the pump cord is pulled). They are easy to install and replace since they are independent of the pump. The variable level float switches are installed by attaching them to the discharge piping system. 1) Piggyback which means the pump motor is plugged into the float-switch and the float-switch is plugged into the wall socket. The piggyback switch has an advantage. If the switch fails the pump can be operated manually by plugging the pump directly into the wall socket and monitoring it so the pit does not pump dry and burn the motor out. 2) Tethered float switch rather than vertical. 3) Omni-directional; that is they have no 'up' side. 4) Use 12 to 15 amps when running. 6) Come in two styles - single and double. a) The single piggyback has one float-switch: Item number 10-0055 (10 foot cord using 12 amps), 10-0034 (15 foot chord using 13 amps) and 10-0063 (20 foot chord using 13 amps). The minimum pumping range is six inches. The maximum pumping range is thirty-six inches. b) The double piggyback has two float switches: Item number 10-1094 (15 foot chord using 15 amps). The minimum pumping range is three inches. The maximum pumping range is fourty-eight inches. 1) The homeowner determines the height of the ON and OFF point when the float will activate the switch which triggers the motor to start and stop. If your pump runs daily but not continuously it is possible to raise the height of the float so the motor will not run (pump) as frequent. This saves on electricity and the wear of pump parts and motor. 2) A double variable float-switch offers even more advantages because the homeowner has more options at which to set the ON and OFF height. b) The top float can be set anywhere from seven inches to thirty-six inches high. 3) It is possible to change the ON and OFF point at any time. To keep up with the heavy water flow into the basin, the ON OFF points can be lowered to keep up with the water volume and remove the water faster from the basin. All manufacturers float switches will eventually fail. Float-switch failure depends a lot on how often the sump pump runs. If the pump runs more than once a day and continuously during heavy rainfalls you can expect the switch will last three to five years. If the sump pump rarely runs the switch will last much longer. Some homeowners report their switch has lasted ten years. The Zoeller pump housing and motor will outlast the switch. The housing and motor are build to last almost forever. In fact, only eightly percent of the motors capacity is used during a pumping cycle which results in motor longevity. Most of the time the float-switch will fail during heavy continuous pumping; therefore it is wise to replace the switch every three to five years depending upon the frequency of usage ton prevent flooding. The smart homeowner will keep a replacement switch on hand. Replacement of the switch is easy. Follow the replacement steps below. Return to Zoeller Float Switch Topics. The Zoeller float switch will fail before the sump pump motor or pump housing; therefore Zoeller makes replacement switches available for Models Mighty-Mate M53, M55, M57, M59 and Model Flow-Mate M98 and Waste-Mate 264 and M267. The replacement switch part number #004892 is made by Zoeller; therefore it fits perfectly any of the series 50 and 90s sump pumps. The switch is easy to replace. See switch installation instructions below. The replacement switch part number #04705is made by Zoeller and fits Models Mighty-Mate M53, M55, M57, M59, Flow-Mate M98 amd Waste-Mate M264. The replacement switch part number #004740 (or 46045) is for Flow-Mate M137 and M139 and sewage pump M267. The Zoeller float switch is easy to replace. If the pit is dry and the four screws holding the pump head turn, it may be possible to loosen the screws and replace it without removing the pump from the pit. The following steps define how to replace a failed float-switch. 1. Empty the contents from the replacement parts package. 2. Unplug the sump pump. 3. Remove the check valve. 5. Drain the water from the pump. 6. Remove the four screws on the top. 7. Remove the head unit and place on side of pump..
9. Take a picture of the wiring connections to make it easier to rehook. 10. Unhook the two white wires from the head. 11. Remove the gasket. Clean off any residue. 12. Remove the arm from the top of the float if necessary. 13. Replace the float. May use the old bar if in good condition. 14. Put the gasket on. 15. Hook the wires back up. The black wire comes from the pump and gets hooked on the top connection on the head. The white wire comes from the switch and gets hooked on the housing body. 16. Put the Zoeller head back on. It may take a little time to get the four screws to line up. 17. Sump Pump screws, guard and handle are stainless steel. Stainless steel will not rust and has strength. 18. Plug the pump in. 19. To test the new switch hold the float bar down to see if the motor will run. 20. Put the white screw back in the side of the pump by the handle. 21. Put the Zoeller pump back in the basin. 22. Reclamp the check valve. 23. Test the pump again. The replacement gasket part number #034046 is made by Zoeller and fits Models Mighty-Mate M53, M55, M57, M59, Flow-Mate M98 and Waste-Mate M264. We have replaced our M53 gasket once. Our M63 is 12 years old. The gasket is very easy to replace. Just open four screws, remove the old gasket and replace it with the new. The gasket fits perfectly. The replacement float rod part number #054062 is manufactured by Zoeller. The replacement float part number #034019 is manufactured by Zoeller. The floats found on the automatic pumps are unsinkable if they are punctured because they are buoyant solid polypropylene. It is highly unlikely that the float will need to be replaced. Zoeller also makes a replacement guide assembly part number: #034086 for the float. Zoeller 49-0005 1/4 1500 Enginerd Plastic Tether 3/8 in 1 1/2 in 3.8 18 ft. 12 in 7.25 3.0 in 9 ft.
Zoeller M53 1/3 2040 Cast Iron 2-Pole Vertical 1/2 in 1 1/2 in 9.7 19.25 ft 12 in 7 1/4 3 in 9 ft.
Zoeller M55 1/3 2040 Bronze 2-Pole Vertical 1/2 in 1 1/4 in 9.7 19.25 ft 12 in 7 1/4 3 in 9 ft.
Zoeller N55 1/3 2040 Bronze Variable Level 1/2 in 1 1/2 in 9.7 19.25 ft 12 in Adj. Adj. 16 ft.
Zoeller M57 1/3 2040 Cast Iron 2-Pole Vertical 1/2 in 1 1/2 in 9.7 19.25 ft 12 in 7 1/4 3 in 9 ft.
Zoeller BN57 1/3 2040 Cast Iron Variable Level 1/2 in 1 1/2 in 9.7 19.25 ft 12 in Adj. Adj. 16 ft.
Zoeller N59 1/3 2040 Cast Iron Variable Level 1/2 in 1 1/2 in 10 19.25 ft 11 icn Adj. Adj. 16 ft.
Zoeller M72 1/3 1800 Enginerd Plastic 2-Pole Vertical 3/8 in 1 1/2 in 3.1 18 ft 11 in 7 3/8 3.5/8 in. 9 ft.
8 1/2 3 3/4 in. Zoeller N137 1/2 4740 Cast Iron Variable Level 5/8 in 1 1/2 in 10.7 26 ft 18 in Adj. Adj. 15 ft.
Zoeller N139 1/2 4700 Bronze Variable Level 5/8 in 1 1/4 10.7 26 ft 18 in Adj. Adj. 15 ft.
12 1/2 4 1/2 in. Zoeller M267 1/2 3000 Cast Iron 2-Pole Vertical 2 in. 2 inch 10.4 21.5 ft 18 in 12.0 4.0 in. 10 ft.
Zoeller manufactures check valves. They are highly rated by consumers and are easy to find online. 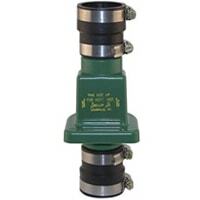 Zoeller makes many check valve styles ranging from those that slip on both ends of the discharge pipe and those that are glued on. Sizes also vary from 1 1/4 inch to 2 inches. As for the water thumping sound, Zoeller manufactures both the standard and the quiet check valve. The quiet check valve reduces the thumping sound. Zoeller check valves are very reasonably priced ranging from $9 to $30. When sump pump float switches fail, if no battery system exists, the basin may overflow. A high level water alarm alerts the homeowner when such a condition exists. Zoeller manufacturers two water alert series. They are the A-Pak and the Aquanot Flood Alert. The Aquanot Flood Alert Series uses three AAA batteries. Stainless steel is used for the sensor contacts. The alarm can be installed as is without adjustments. The alarms are made of solid-state electronic components, have a five foot lead wire, and have an AC power adapter capability (Class 2 transformer, Type B Plug). The Aquanot Flood Alerts has a 103 decibel horm to alert the homeowner when the sensors are contacted by water and when the alarm batteries are low. There is an on/off silence button to silence the alarm. The model number is 10-0763. Return to Shop Zoeller-Pumps Index. Go to Shop Zoeller Pumps Topics. Go to Shop Zoeller-Pumps Topics. Return to Shop Zoeller Pumps Index.